Design the beloved home to your own taste and give each room a distinctive touch, assemble a garden shed or furniture for the living room and convert the attic to a cozy apartment without any help – an experienced home improvement can do it all and more. DIY is trendy today. Home improvement is fun, encourages creativity and saves a lot of money. The market responds to a growing demand for tools with a wide range. 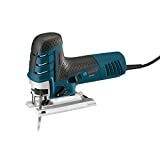 Circular saws and angle grinders, motor-driven screwdrivers and milling machines, planers, and drills – the list of popular devices offered in professional and semi-professional quality are long. What is an electric jigsaw? 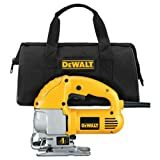 For which users is a jigsaw with electric drive designed? How is a jigsaw constructed? What is a jigsaw with pendulum stroke? How are the chips removed when sawing? What is the advantage of interface lighting? How can a straight, long cut be realized? How to choose the right saw blade? Which base is best for sawing? What should be considered when working with a jigsaw? How do you find a jigsaw that best suits your needs? 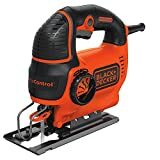 An electric jigsaw is a compact motorized saw used to machine various materials, including wood, metals such as stainless steel or aluminum, plastic, leather, and laminate. In the vast majority of models from the selection on gmomf.com sawing is done by moving up and down – the so-called lifting movement – a saw blade made of stainless steel. On some jigsaws, the pendulum lift function can be activated for extra speed. A jigsaw excels on the one hand by its compact dimensions and on the other hand by the multifunctionality: This tool is just as well suited for performing a straight cut as for a curve or miter cut. Both pure jigsaws and the jigsaws with pendulum lift are designed for a fairly wide range of users. 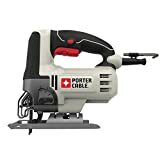 This tool is suitable for DIY enthusiasts and professional craftsmen, for occasional users and for those who regularly have to cut different materials. Basically, almost all tools from this category work on the same principle and are therefore similarly constructed. In this section, we will cover the most important elements of an electric jigsaw in order to take a closer look at individual features. The first key element of any jigsaw is an electric motor that converts electrical energy into mechanical movement of the saw blade. The saw blade is the second core element of this tool, depending on the material to be machined, a different saw blade is used. The saw teeth of a saw blade almost always point forwards and upwards, thus a jigsaw separates the material only during the upward movement of the saw blade. The motor, saw blade clamping system and controls are integrated into a plastic housing. Lever for switching the jigsaw on and off. This is usually to be kept pressed during work in order to always be able to adjust the lifting speed. A slider for switching on and off. After this slider is pressed, the engine starts and sawing can start. Rotary or slide control for presetting the number of strokes. For the models with an on / off slider, the engine speed and thus the number of strokes must be set separately. There are only a few models available on the market where the number of strokes is not adjustable. The knob to adjust the pendulum lift function. If a jigsaw can also be used as a pendulum jigsaw, the corresponding model has another slider for adjusting the pendulum movement. For most pendulum jigsaws, the pendulum movement of the saw blade can be adjusted in three to four stages. Some models that we present to our readers on gmomf.org are equipped with a pendulum lift function. When this is activated, the saw blade not only moves up and down but also back and forth. When moving down, the saw blade jumps back simultaneously to push forward during the upward movement. This circular movement pattern accelerates the cutting process so that on average the process speed is doubled. In addition, the pendulum stroke function brings with it a considerable saving in forces, because the jigsaw moves in the cutting direction almost by itself. During machining, chips are understandably formed, which on the one hand represent a source of danger for humans and on the other hand can hide the clear view of the interface. As protection against the flying chips, many models are equipped with a semi-circular device made of transparent plastic at the front. Some jigsaws have a blowing function, so the chips are immediately blown away to the side. Today, the vast majority of electric jigsaws are also equipped with a connection device for an industrial vacuum cleaner. The connection is located in the rear part of the housing so that the chips are completely sucked in and thus disposed of. 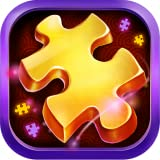 At gmomf.org we inform you about the jigsaws and pendulum jigsaws with a popular function – an interface illumination. A power-saving and long-life LED lamp illuminates the interface purposefully and intensively. In this way, the precision is radically increased. Last but not least, this feature proves to be useful in difficult lighting conditions. Contrary to widespread opinion, a jigsaw is also the right choice for long, straight cuts. A clear plastic guide rail with a straight line marked on it. This sets the direction, however, is only a few inches long and therefore only partially helpful. The same can be said of a laser beam that marks a straight line on the workpiece with light. At the same time, of course, it can only work with a saw blade, but a DIY fan and a hobby craftsman will inevitably require several saw blades. The supply of a jigsaw usually contains a single saw blade, usually one for wood. If more materials have to be processed, the tool arsenal will inevitably have to be expanded. Should it be a straight cut or should it cut around the bend? The tighter the curve and the more filigree the planned cut, the narrower a saw should be. For a straight cut, on the other hand, relatively wide saw blades are recommended. How thick is the workpiece? A saw blade should be at least 15 mm longer than the width of the material to be machined. In addition, pay attention to the tooth geometry, because the distance between the individual teeth must under no circumstances be greater than the thickness of the workpiece. How fast should it be machined? The coarser the tooth geometry, the faster the material is separated. However, the quality decreases with the increasing speed, so that it comes to frayed, unclean cut points. Good to know: Ground teeth always ensure a cleaner cut than milled saw teeth. When working with a jigsaw usually a solid base is needed. In addition, the workpiece must be properly fixed so that it is cut clean. Sticking with one hand is in most cases insufficient. Commercially practical workbenches are available specifically for a jigsaw or pendulum jigsaw, suitable for straight cuts as well as sawing curves and angles. Inappropriate handling of a jigsaw threatens a not inconsiderable risk of injury. This tool is to be used exclusively for the purpose of machining of the materials suitable for this purpose. Our product comparison portal on gmomf.org presents you several models and designs of jigsaws at the same time. Despite a largely similar structure, not insignificant differences between the individual devices can be determined. How much money are you willing to invest in a new tool? On the market, electric jigsaws are available for between 30, – and 300, – EUR. Our tip: The most expensive device is not necessarily the best for you. Should it be a pure jigsaw or a pendulum jigsaw? If you are interested in getting up to speed as quickly as possible, then a jigsaw with pendulum lift is just right. Do not forget: The pendulum lift function can not only be set flexibly but also switched off. Do you value flexibility? Then you decide on a jigsaw with a variable number of strokes. This can be set on most models between 500 min-1 and 3,000 min-1. The higher the number of strokes, the faster you get ahead. The lower the number of strokes, the more precise and cleaner the cut. Which workpieces should be processed predominantly with a jigsaw? The manufacturer’s specifications of each model include the maximum width or thickness of the material. This is usually stated for wood, aluminum, and stainless steel. So, think in advance if the power of the selected model will really work for your future projects. Do you sometimes want to carry the jigsaw with two hands, and do you sometimes have to saw overhead? Then a model with a bar grip is the right solution. All professional jigsaws are equipped with a rod or knob handle. A jigsaw with the bow handle, however, is the right choice for beginners. Do you value ergonomics? It is not unusual to work with a jigsaw for hours, so the ease of use is enormously important. On the one hand, the weight of the tool plays a major role, with the models weighing less than 2.5 kg are preferable. On the other hand, the handle should be equipped with rubberized, non-slip elements for a secure fit. Do you sometimes work in low light conditions, such as at dusk or in an inadequately lit workshop? Then the interface lighting is of crucial importance to you. An LED lamp illuminates your mark an interface, giving you maximum accuracy in sawing. Do you own an industrial vacuum cleaner, which is also designed for the extraction of wood and metal shavings? If so, then pay close attention to a device for connecting this device. which are equipped with a corresponding feature. If you can not call an industrial vacuum cleaner your own, then a jigsaw with practical blowing function is recommended. The chips are swept away by a cool stream of air when working so that the view of the interface is always free. Do you often have to switch between different materials or do you mostly only saw wooden beams and panels? 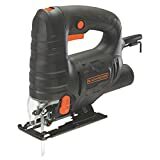 If your DIY activities are broad, then you understandably have to re-insert the saw blade more often and are happy if the saw blades are immediately at hand. Therefore, before purchasing, please inform yourself about the assortment of the respective manufacturer regarding this accessory. No less important is the possibility of a tool-free change of the saw blades, with this feature most of the current models are already equipped. Now a jigsaw or a pendulum jigsaw has been purchased and we can start. An electric jigsaw is ready to go immediately, at least one saw blade is included. Make the necessary preparations by marking the cutting line using either a pencil, marker, stencil or strip. Fix the workpiece on a firm surface in such a way that the saw blade can work freely. If possible, it is recommended to clamp the workpiece to eliminate the vibrations. Especially at high swing speeds, it is recommended to cut the workpiece from the back. Each jigsaw cuts, as we mentioned earlier, as the saw blade moves upwards. On this side, the cut looks less demanding. Turn the workpiece over for a better cut. Select a saw blade that fits the material, the intended cutting speed and the quality of cut you are looking for. Take advantage of the chip breaker. This handy accessory is particularly useful when cutting wood by pressing on the interface and preventing whole chips from being torn out. Make sure that the jigsaw has a firm footing – the saw shoe should rest as tightly as possible on the horizontally placed workpiece. Hands-free work is not recommended for beginners. It is extremely important that you move the jigsaw with a very slight pressure only forward, ie in the cutting direction. Under no circumstances should the saw be moved sideways as it may lead to saw blade fracture. When the pendulum lift function is activated, the jigsaw moves on by itself and only has to be guided along the cutting line.